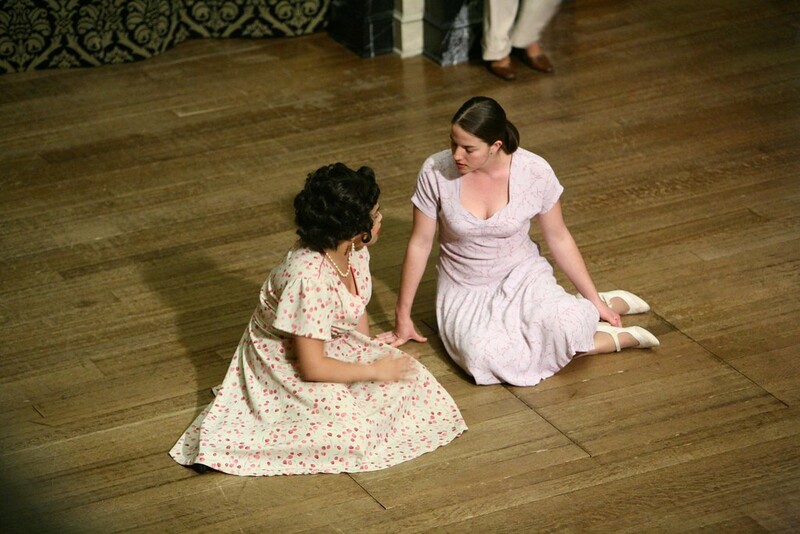 Olivia Braza and Alyssa Wilmoth in MUCH ADO ABOUT NOTHING. Photo by TOMMY THOMPSON. 2006. 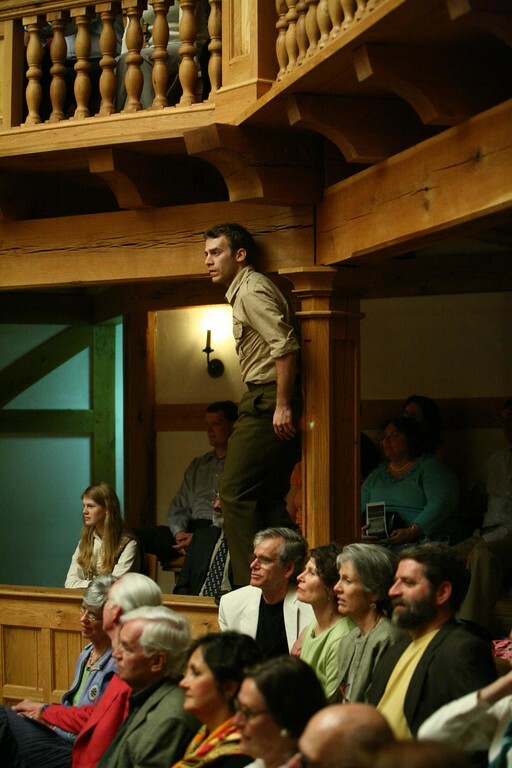 Tyler Moss in MUCH ADO ABOUT NOTHING. Photo by TOMMY THOMPSON. 2006. 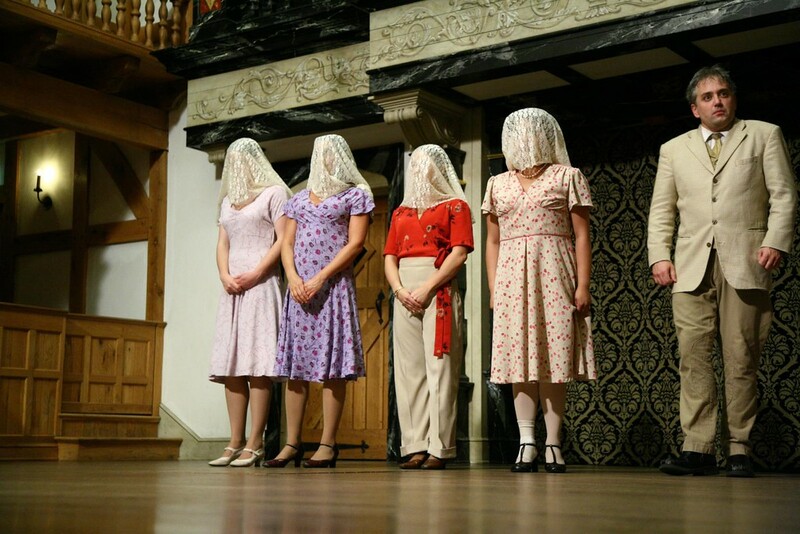 The cast of MUCH ADO ABOUT NOTHING. Photo by TOMMY THOMPSON. 2006. 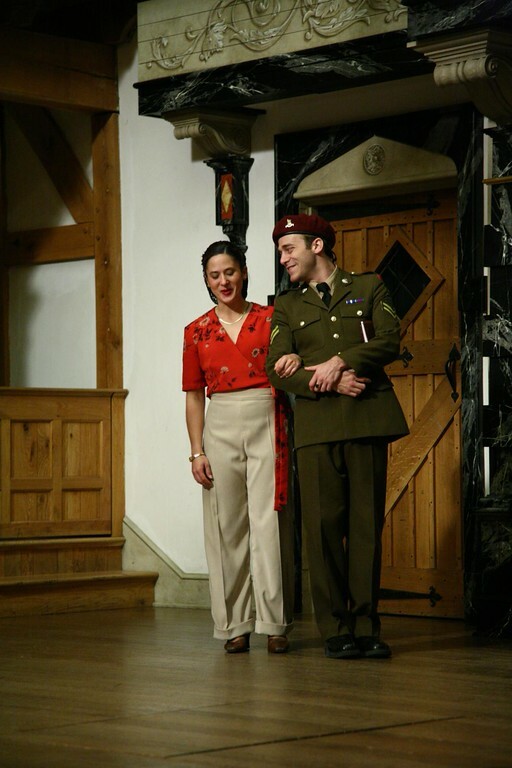 Olivia Braza and Gregory Jon Phelps in MUCH ADO ABOUT NOTHING. Photo by TOMMY THOMPSON. 2006. 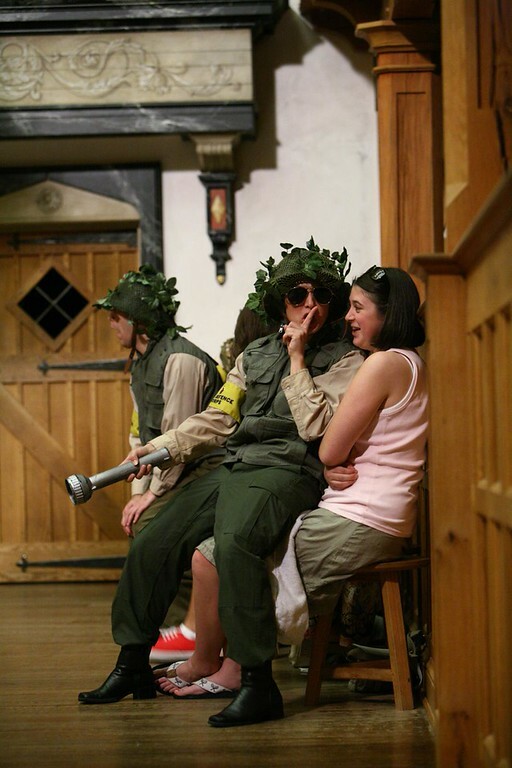 Alyssa Wilmoth and Tyler Moss in MUCH ADO ABOUT NOTHING. Photo by TOMMY THOMPSON. 2006. Leonato, Governor of Messina, welcomes the victorious Don Pedro, Prince of Aragon, and his men after a battle. 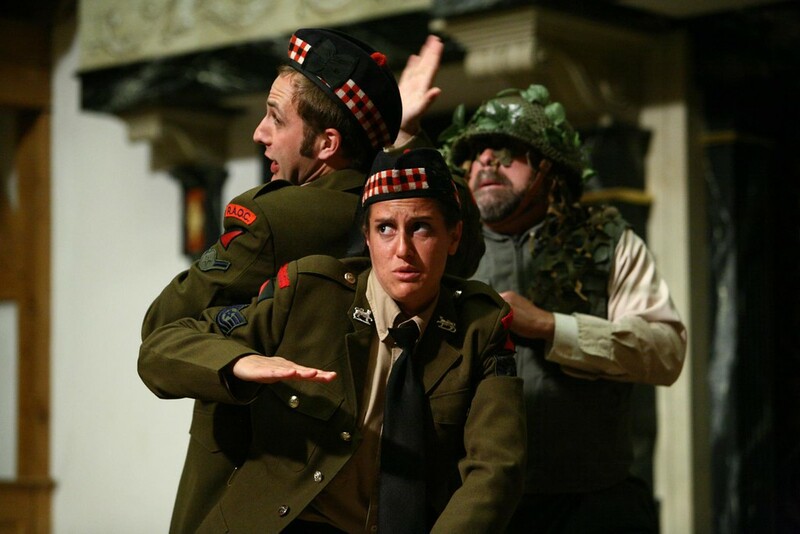 Beatrice (Leonato’s niece) and Benedick (a lord and companion to Don Pedro) continue their “merry war” and verbally spar with one another. Claudio (a younger lord and companion to Don Pedro) tells Benedick and Don Pedro that he is in love with Leonato’s daughter, Hero. Borachio, another servant to Don John, says that he overheard the Prince’s plan to woo Hero for Claudio; Don John then asks his men for assistance to “cross” Claudio. At the masked party, Don John convinces Claudio that Don Pedro has wooed Hero for himself. Borachio, another follower of Don John, devises a plot with Don John to make Claudio believe Hero has been unfaithful. Villainy, shaming, growing up, and much about what matters most ensue. Writing this “note from the director” reminds me of the extent to which I have found myself sometimes taking these great plays for granted. 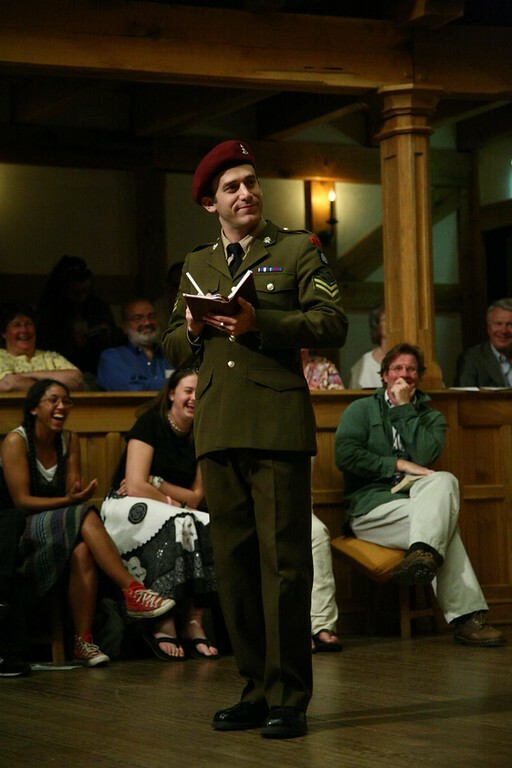 Welcome to our production of Much Ado About Nothing, a play which must have been performed thousands of times over the last 400 years or so. I wonder if our actors are the only people on the planet speaking these words at this precise moment? It’s very humbling. Now is a great opportunity for us, as actors and audience members, to make our time with this story unique. I hope we don’t blow it. Much Ado About Nothing is the kind of comedy that keeps its audience painfully aware of how tragically it could turn out, right until the last moment. It contains equal measures of sparkling wit and extreme pathos. It is a high stakes comedy, with everything to lose. I hope that the troupe and I will find a way to bring you this story in a like manner. I was interested in us trying to establish the immediately-post war atmosphere of the play’s beginning as something very recognizable: the famous photographs that captured the Allies’ responses to the end of WWII seemed particularly alluring. Looking at those tickertape parades, those joyous quayside reunions, and Alfred Eisenstaedt’s photograph of the sailor kissing a girl in Times Square on V.J. Day, you can almost hear the Andrews Sisters chirping in the background. I was also intrigued by the idea of a sudden influx of returning veterans engulfing the grateful but surely fragile communities they had left behind. I wonder if, at the time, the future seemed a bit uncertain. 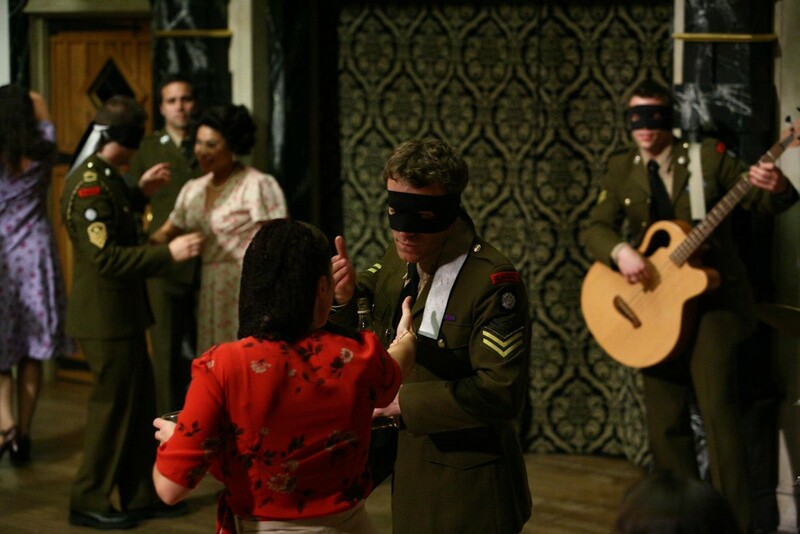 Large sections of the play are written in prose. A friend and Globe Theatre colleague once gave me the idea that Shakespeare’s verse “speaks from the heart” and that prose is really “the mind censoring the heart.” The idea that prose is somehow more “knowing” than verse interests me. I thought it might be worth exploring this idea in our production. It’s certainly interesting that the first “heartfelt” words that Beatrice speaks when she professes her love for Benedick, not to Benedick himself, but to the audience are her first lines of verse in the play. I wonder what you’ll think. I hope you find that our production has a strong physicality, in the way the troupe moves, the way it tackles the words and the pace of the show. It’s always great for a group of actors to be at the peak of its physical and vocal fitness, as it means you can do more, better. 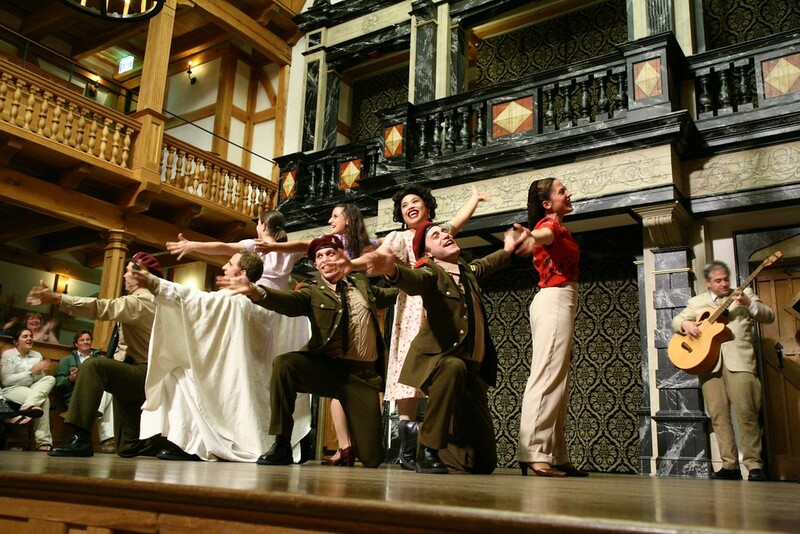 The Blackfriars Stage Company began life as the Shenandoah Shakespeare Express, quickly distinguishing itself as the company that did more, better, faster. So, I reckon, we have sizable boots to fill. I think that, sometimes, Beatrice and Benedick are sometimes theatrically misunderstood. Nobody really enjoys bitching all the time. In fact, they strike me as rather sad characters: Beatrice, a lovely, scared young woman who is perfectly capable of talking her way out of any meaningful relationship, and Benedick, a rather insecure, likable man who wishes he didn’t have to rely on his quips so much. I suspect both initially envy the young lovers Claudio and Hero, though neither would admit it.